The idea of antimatter first emerged in 1928. In that year, Paul Dirac derived, from first principles of quantum theory, a wave equation for the electron that included the effects of special relativity. It was a stunning achievement and marked the beginning of modern quantum field theory. However, the Dirac equation had one very strange property – there were dual solutions for the equation, implying that positive and negative energy levels existed for the particle. What was the physical meaning of a whole extra set of energies of opposite sign for the electron ? It couldn’t be that a repulsive electromagnetic force also existed, as the atom would fly apart. Dirac eventually decided that the only sensible answer was that the equation also described the energy of a particle of opposite sign to the electron. This was an outlandish prediction of a brand new version of quantum theory and few scientists were convinced. However, in 1932 the experimentalist Carl Anderson discovered the decay track of an intriguing new particle in studies of cosmic rays – a particle that was of the same mass as the electron, but of opposite charge (the anti-electron or positron). 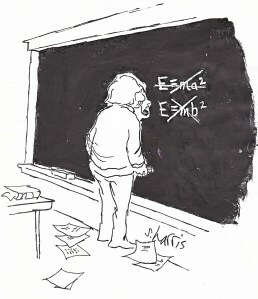 It was a spectacular success for Dirac’s equation and marked a watershed in quantum theory. Long years later, other anti-particles were discovered in accelerator experiments, from the anti-proton to the anti-neutrino. In the 1980s, accelerator physicists managed to create entire anti-atoms of hydrogen, by allowing positrons to be trapped by anti-protons. However, such ‘hot’ anti-atoms are hard to study and the next challenge was to create ‘cold’ anti-atoms so their properties could be studied in detail; this was achieved in the late 1990s. From the first, it was realised that antimatter and matter would annihilate on contact (from relativity), and this raised a new fundamental question in physics: Why do we live in a universe made almost entirely of matter? Why didn’t matter and anti-matter annihilate immediately after the Big Bang? This puzzle hints at a deep asymmetry in the decay of matter and antimatter and is known as the puzzle of baryogenesis, more on this later.. Yes, can’t wait. I was a little put off by the review in The Sunday Times, but I think it was just a poorly written review..
Is the “from relativity” bit entirely true? Is the concept of anti-matter even meaningful from a pure-relativity standpoint? Good question. One learns in class that it is only when SR is taken into account in the wave equation for a particle that the double energy levels (signifying AM) arise. Relativity is invoked a second time in order to explain the conversion of the mass of M/AM into energy. However, it could be argued that there are hints of AM in relativity without QT. After all, E2 = m2c4 + p2c2 has double solutions!I too haven’t looked at this in awhile, must look it up..
hence: as soon as there’s existence, surely there’s asymmetry?